Since CFITrainer.Net® has been delivering programs, we have often been asked, “What do I do with the training I receive on CFITrainer®?” The answer really depends on the user’s needs and where they are in the profession. The experienced investigator, who holds a certification such as IAAI-CFI® or one from another certifying organization, may need the programs for continuing education or re-certification. The users who are just entering the profession either on the public or private side may be using the programs to develop their knowledge of the fire and its investigation. 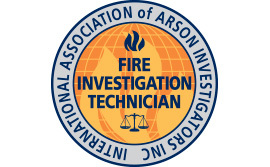 The IAAI has developed the IAAI-FIT® (Fire Investigator Technician) credential specifically for individuals who perform fire investigation functions but may not have the training and experience - or need - to qualify for the IAAI-CFI® (Certified Fire Investigator) certification. IAAI-FIT® is designed for those who may be responsible for the initial origin and cause investigation, or those individuals in related professions who support the fire investigators at fire incidents. Selected job performance requirements (JPRs) from NFPA 1021, NFPA 1033 and NFPA 1037 were used to define the requirements for this credential. The IAAI-FIT® credential allows investigators and support personnel to validate the training and experience they have attained through training and education and programs available on CFITrainer.Net®. For more information on IAAI-FIT® and other IAAI credentials and certifications visit the IAAI at www.firearson.com.